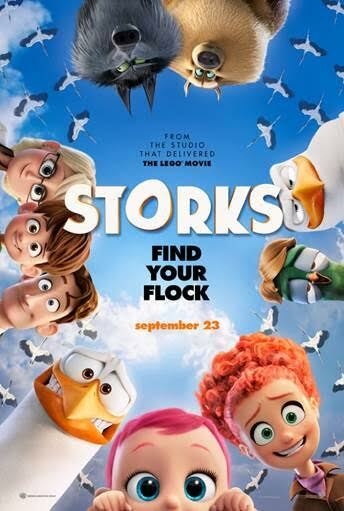 Get ready, because the STORKS are coming your way! Watch the movie trailer. Disclaimer: We were not compensated for this blog post. All opinions are 100% our own. All information, images and videos are the property of Warner Bros. Pictures and are used only as promotional material. Ever since I saw a short clip a couple of years ago, I have been wondering and waiting for this movie. I am so excited that the wait is almost over, and that in a matter of a month and a half, we will finally get to meet the STORKS. In the mean time, watch the newest trailer, and keep on reading to find out more about this movie. Time to find your flock! The new trailer for STORKS is here, featuring Jason Derulo's song, “Kiss the Sky.” In theaters September 23rd! After years of living on Stork Mountain, Tulip has perfected her engineering skills (kind of) and created plans for the ultimate flying machine and it's your job to help her build it! Collect the proper amount of parts on the list to complete each level and build a portion of the ship avoid picking up any unnecessary weight or you might drop everything. Avoid the anvils and collect stars to lighten the load. Wondering if you have what it takes to soar to the top of Stork Mountain? “Storks Delivery Dash” lets you join the exciting world of winged delivery service. Fly through the neighborhood and deliver packages by air with flawless timing and stork-like precision. And remember to watch out for obstacles! Cornerstone relies on dependability!